A fire broke out in the basement of a College Point wholesale store this morning leaving one employee seriously injured. 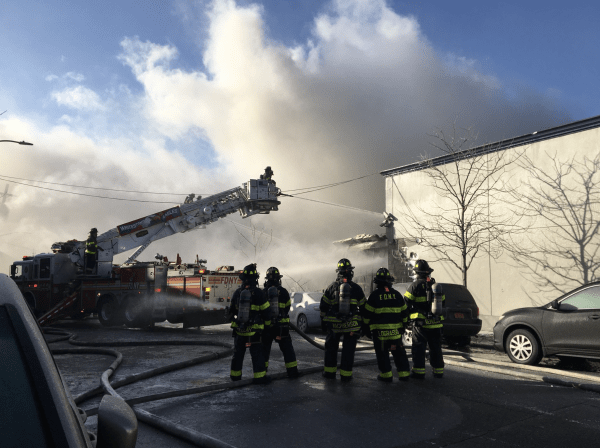 A call came into the FDNY at around 7:40 a.m. that Central Home Care, a wholesale toy and medical supply business at 128-20 14th Ave., was engulfed in flames. The FDNY deployed 33 units and 138 firefighters to extinguish the blaze, which was in the basement and first floor fire. Firefighters were able to evacuate all employees. However, one of the workers was found unconscious in the back of the store on the first floor. EMS transported the man to NYC Health + Hospitals/Jacobi in the Bronx where he is listed in critical condition. Three firefighters sustained minor injuries. The fire was brought under control by 10:47 a.m. and the cause remains under investigation.